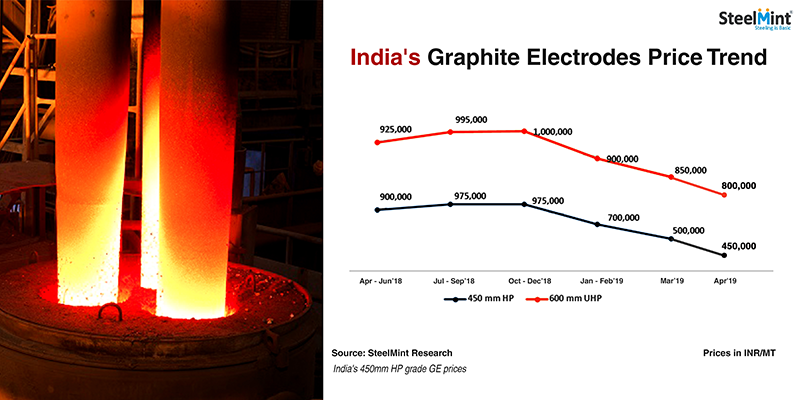 SteelMint had reported in Mar’19 that the graphite electrodes prices in India registered a fall of INR 50,000 (USD 721/MT) against its prices in Jan and Feb’19 and now if reliable sources are to be believed, it seems that Indian Graphite Electrode manufacturers have further lowered the grade electrode prices by INR 50,000/MT for the April month. Subsequently, the price of UHP grade Graphite Electrodes of size 600mm is likely to be around INR 800,000/MT (USD 11,540/MT) and that of lower grade electrodes (HP grade) of size 400-450mm the same is estimated to be around INR 450,000/MT (USD 6,500/MT). Last month the plunge in lower grade electrode price was higher (almost by USD 2,000/MT) compared to higher grade ones. However, this month the fall in case of both the grades GE is same. Amid the rapid increase in GE demand and prices in the latter half of 2017, the Indian manufacturers entered into quarterly contracts with the GE consumers. However, the market dynamics changed towards the end of 2018 which led to fall in Chinese GE prices, indirectly impacting Indian graphite electrode market. Market participants have informed us that in the given market situation, instead of entering into the quarterly contracts like before, GE buyers have started negotiating for prices contracts on monthly basis and this is why prices have changed over past two months. However, no one has confirmed that if this trend of monthly negotiations will continue in the future also. With GE exports not being made to Iran due to sanctions there is ample availability of graphite electrodes in the Indian market and buyers are maintaining inventory of just 10-12 days which was earlier kept for 30 to 40 days. Why the Plunge in Indian Graphite Electrode Prices? The fall in Indian Graphite Electrode prices can be attributed to the ongoing downtrend in Chinese Graphite Electrode prices since the start of the winter heating season from mid-November 2018. During this season (Nov-Mar), steel demand in China takes a beating and the country imposes production cuts in the steel sector that indirectly affect Graphite Electrode demand (which is a key raw material in steel production via the electric furnace route). China is a major Graphite Electrode producing and exporting country and its price trends usually affect global Graphite Electrode prices. Thus, Indian producers need to take into account the prices in the Chinese market while finalizing their quarterly contracts. Another key factor that poses a threat to Indian Graphite Electrode manufacturers is the removal of the anti-dumping duty on Graphite Electrode imports from China announced in August last year. This elimination of trade restrictions on Indian imports of Chinese Graphite Electrodes has increased the risk of Chinese electrodes freely entering the Indian market. In fact, Indian EAF steel producers are anticipating further fall in Graphite Electrode prices, as according to them importing China’s UHP grade Graphite Electrodes will be cheaper compared to Indian electrodes. The price of China’s 600mm UHP grade Graphite Electrode is currently RMB 65,000/MT (USD 9,700/MT) and importing the same to India, even including customs duty, still makes it cheaper by USD 800-1,000/MT against India’s domestic Graphite Electrode price. According to market sources, Indian Graphite Electrode manufacturers are facing tough competition from Chinese imports of lower grade HP (High Power) and RP (Regular Power) Graphite Electrodes. This is because the production of lower grade electrodes in China is increasing and amid sufficient availability, prices too are falling. In a period of just four months from Nov’18 to Mar’19, China’s HP grade Graphite Electrode price of size 450mm has plunged by 60% and is currently trending at RMB 27,000 (USD 4,023/MT). “With the removal of the anti-dumping duty, importing Chinese Graphite Electrode has become quite feasible and given the current HP grade electrodes price in China, importing the same even after including all the duties is still proving to be cheaper for us compared to buying Indian products. Thus, Indian Graphite Electrode producers have no option but to revise their prices,” said a GE buyer from India. According to customs data, India imported about 1,030 tonnes of electrodes in January this year against just 395 tonnes in Jan’18 registering a y-o-y growth of more than 150%. Out of this 1,030 tonnes imported, about 98% imports came from China. In December 2018, India had imported 1,404 tonnes of electrodes with only 30% being contributed from China. In 2018, India imported 7,242 tonne of Graphite Electrodes out of which imports from China was 55% at 4,018 tonne. In 2017, India’s total Graphite Electrode imports stood at 3,871 tonne and China’s contribution to total imports was only about 14%. This clearly shows the impact of the lifting of the anti-dumping duty on Chinese imports. In case of other countries such as Japan and the US, Graphite Electrode contracts are usually locked for six months and prices have been fixed at USD 14,000 per tonne till June 2019. Amid falling Graphite Electrode prices, Indian manufacturers are troubled by rising needle coke costs, the contract for which has been fixed at USD 4,200-4,500/MT, an increase of USD 1,000 per tonne. This indicates that Indian manufacturers’ margins may suffer in the upcoming quarter. To know more about how the Graphite Electrode market will pan out in the days to come, book your seat at the ‘2nd Global Graphite Electrodes Conference, Bangkok’, from 27 to 29 August 2019.